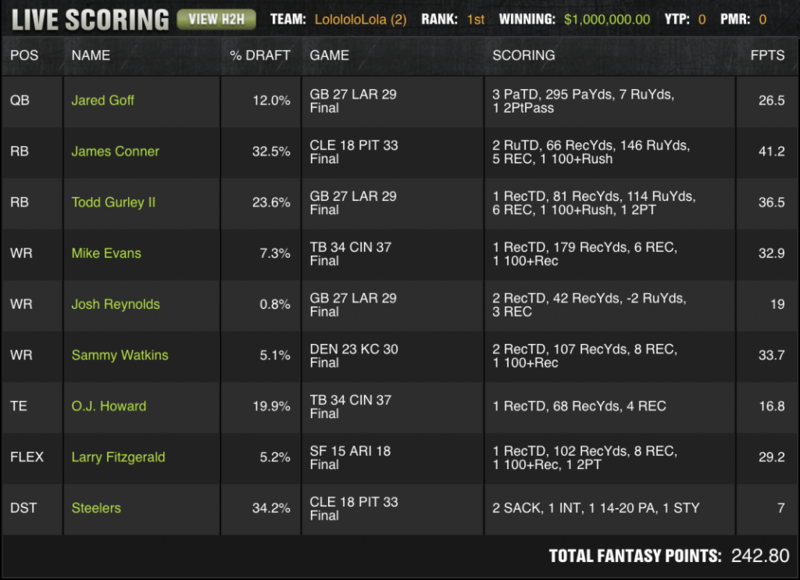 A person who goes by the username “LolololoLola” figured out all the optimal pivots and rode a foursome of low-owned receivers all the way to the top. Amazingly, “LolololoLola” played just two entries in the Roman Fantasy Football Millionaire contest and within those entries she simply locked Steelers D/ST, Gurley II and Mike Evans. 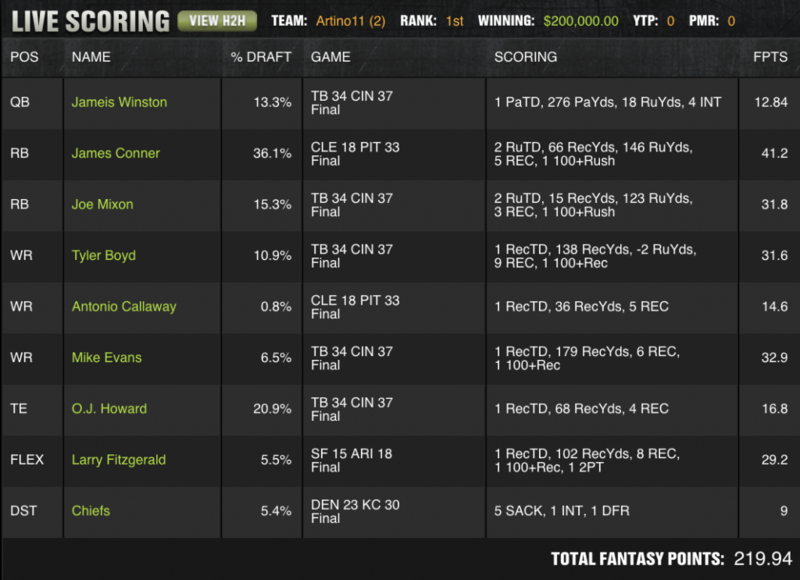 Since Evans was just 7.3-percent owned, that gave user LolololoLola a 92.7-percent leverage on the field! LolololoLola utilized both a double Rams stack and the RB/defense stack of the Steelers. The combined ownership percentages of the WRs rostered in this lineup was 18.4-percent or about half a percentage less owned than A.J. Green alone. Sammy Watkins, Larry Fitzgerald and Reynolds all out-performed their previous season best by at least 11 fantasy points with Fitzgerald and Reynolds more than doubling their previous season-high fantasy totals. Yet again, it was not the team that faded the chalk that won one of the biggest tournaments across the industry, but rather someone who chose the correct chalk (four plays with over 19.5-percent ownership in total) paired with the proper contrarian plays. The amazing part is Artino11 was able to withstand the 12.84 fantasy point flop from Jameis Winston who has benched for Ryan Fitzpatrick in the second half. Fitzpatrick managed to score more fantasy points than Winston and he was actually the player who catapulted Evans to fantasy relevance as well which was huge for Artino11 (who rostered him as well). Evans caught three passes for 111 yards and a score from Fitzpatrick alone which was obviously a huge chunk of his six reception, 179-yard, one score performance overall. Like the aforementioned LolololoLola, Artino11 only used two lineups in this contest, except he did not use 100-percent of any player. He rolled out two completely different rosters and one ended up hitting. It is interesting to see the contrast in styles between two users who had serious success this week despite not relying on mass-multi entry. The first thing that stands out in his builds is the number of total flops in the top 10 beginning with Bryant. If Bryant were to have performed at even an average level this week, Awesemo would have enjoyed significantly more success, although he was able to avoid him in his top lineup. Awesemo also hedged his Lindsay investment with shares of Devontae Booker (0.5-percent owned overall, 10.7-percent owned by Awesemo) and, low and behold, Booker ended up on his highest-scoring team (likely because he was a substitute for Bryant as a punt). Luckily, his defense came through for their price and he was heavily invested in guys like Brown and Conner who both scored multiple TDs.